A flash of light somewhere off in distant space signals the end of something magnificent: the highest energy photons we know of produced in an explosion more massive than anything since the beginning of the universe in which it occurs. The high energy photons we receive may last only a few seconds, but at that moment telescopes begin swinging into action. 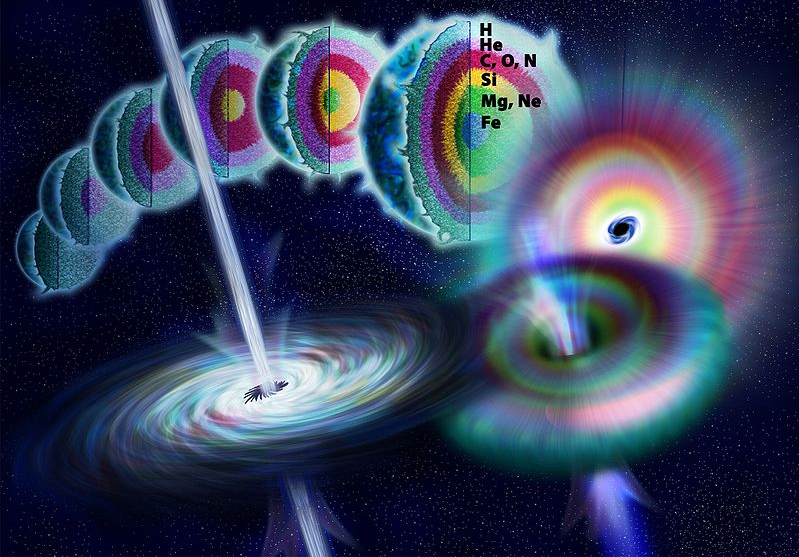 Astronomers have come a long way in understanding these mysterious events known as Gamma-ray bursts (GRBs) in just the past couple decades with the advent of better detection instruments. Because of their short duration and thankfully distant origin (furthest at z=9.4), little was known about their progenitors until very recently. There is now overwhelming evidence that GRB’s signal the death of the most massive stars in a cataclysmic supernovae (SN) of type Ic. Given the lack of hydrogen and helium in SN Ic spectra, it is hypothesized that these stars are stripped envelope Wolf-Rayet (WR) stars that exhibit strong emission lines in their dense stellar outflows. Imagine a giant star losing most of its mass while rapidly rotating finally giving up and collapsing in seconds to give birth to a black hole. The amount of energy released is on unimaginable scales, but we get a taste from the radiation our telescopes detect. 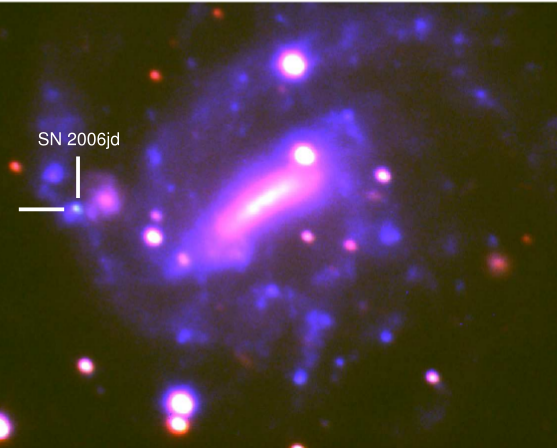 To go further, it is believed that in order to witness a GRB and not just the supernovae explosion, we need to be observing from a special location. As the rapidly rotating star collapses, the most intense energy is directed into a collimated beam pouring out the axis of rotation. If the beam is pointed toward us, we see the short burst of Gamma-rays characteristic of a GRB. Make sure to read this astrobite about specific GRB-SN detections. While this model fits very nicely, astronomers have not yet detected any rotating WR stars. It is natural to assume that that some WR stars rotate, but detecting the rotation is difficult when the star is essentially hidden by its massive wind outflows. All lines we see come from these winds in emission, so a typical absorption-line method via line-broadening is ruled out. In this paper, the authors discuss an alternative method. If a WR star is rotating very rapidly, one might expect the wind to exhibit an asymmetry due to the angular momentum. While these asymmetries would be too small to be resolved visually, they can be detected using a clever technique called linear spectropolarimetry. As the continuum photons from the star’s surface undergo electron scattering as they pass through the wind, if the projected scattering geometry is non-circular in the plane of the sky then the scattering should introduce a small but measurable net linear polarization. The line photons originating in the wind should scatter less than the continuum and therefore be less polarized. 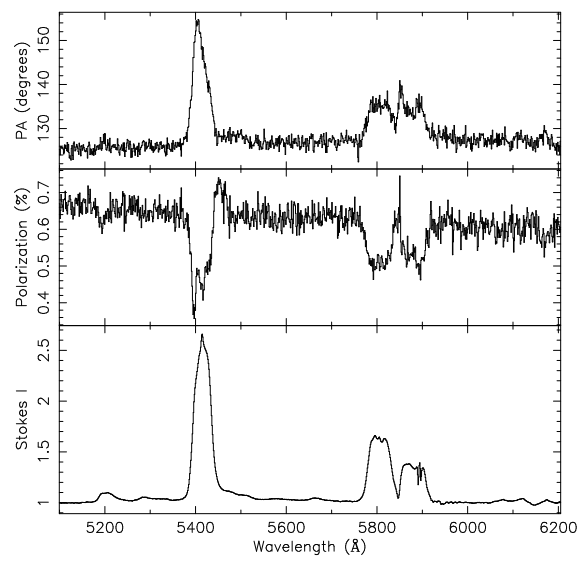 The authors look at a sample of 6 WF stars that have been reported with this type of polarization effect. They confirm that 5 out of the 6 show significant depolarization. There are other cases in which co-rotating interactions or other asymmetries could reproduce the observed linear polarization; however, the authors favor the rapidly rotating explanation.